The art of bread baking begins a fairy tale called. . .life. Our journey into, life. Our walk through life. . .is the baking of bread. Who would have known that a simple task (Mothers providing for a nation) would contain so much depth? December 2016 was a magical, winter tale for a stay in Cairo, Egypt! Adventure and capture of her when she sleeps; revealing hidden beauties, while holding her gaze. A morning stroll through Maadi, (with anticipations of finding a nourishing garden) allowed for stumble into the famous Abou El Sid restaurant. 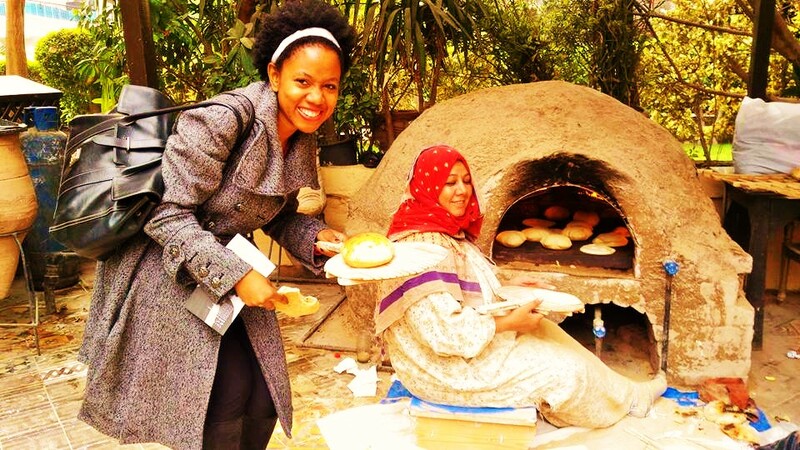 Walking in, with familiar intimacy, awaited two Egyptian-Arab mother figures; ardently moving life into dough. Observing them was a joyous pleasure to be felt. Much of that was partaken, upon entry of this food garden. Two Mother figures were present. Abundant and large representations of the feminine, their presence was Goddess-like. Ancient memory would depict them as divine angels; their womanhood a cure against hunger and misfortunes attacking the human Spirit. Their movements were complementary of each other. They were two, making them the foundation of. . .balance. Such was one of the images, connected with one’s entrance into enchantment! Watching their placement of dough onto wheat granules, symbolized the planting of seeds in fertilized soil. In layman’s terms, we call it. . .yeast. Placing of dough onto wooden paddles was the reflection of preparation. For it is in preparation, where the moment of awakening towards the journey at hand, is realized. That an individual has been prepared, or battered with all the tools necessary for the difficult/challenging tasks ahead. Nevertheless, presentation for the preparation was an essential asset to this storytelling called. . .life. Having been invited to partake in the next chapter of Life, a Daughter and Maiden of Black America became part of the story making process. Egyptian mother figures gave her the wooden tool. A symbolic gesture for the “rough” times of baking dough into its final production. Ovens can serve as hostile places for dough, which enters unprepared. Lacking essential ingredients could result in its destruction. Going against one’s capacity, and nature’s laws, would mean failure for the end goal. It’s why precise measures of time are pertinent in the art of bread baking. Accordance with heat is crucial in such regard. The Mothers understood that. Their hands had been in harmony with dances of time. If one were still, their movements were felt; mirroring delicate patterns of silken creations. Soft. Steady. Paced with harmonic delight. Once the bread is moved from the oven, the process of completion begins. Ready to nourish and be gazed upon. It’s one of those delectable memories, where baked bread (fresh out of the oven), is a soul-soothing memory of magic. Yet, of further euphoria, was the opened cover into this storybook fable. Some would have saved this for the introduction. It would conclude to the perfect ending. Walking into Abou El Sid Restaurant, early morning silence brought peace into the atmosphere. Seats were empty. And hungry bellies were nowhere in sight. Yet, there they were. . .breaking bread. Upon recognition of a foreign Maiden, it was only suitable that she taste their land. In tasting Egypt, she would learn of. . .them. Her sensory would allow experiences with the many Mother figures, who baked bread in this Paradise. Feeding their people, and those coming from afar. After all, she had entered into a Garden, not of her own. It was only suitable that she make contact with the women watering it. Smiles were met. Gazes were exchanged. No one could ever break this temporary bond. For in her entry into the world of bread baking, she affirmed herself, as a seeker of truth. Representatives of the Egyptian feminine, too, recognized this. And so, fresh bread was offered. In order for her to understand them, it was only suitable for her to engage with the story. Chapter 1 was skipped. But, Chapter 2 was mandatory. Only then could she understand her own preparation for the intense journey laying before her. Once Chapter 3 was done, the foreign Maiden was given a preview; a metaphorical visual into the road that lay before her. And lastly. . .Chapter 4. The completion and final product, after having survived and overcome obstacles on that path. Aspiring for perfection in reality’s imperfections. Knowing that the challenge of reaching heavenly bliss, lays in overcoming and surviving chaos. But that is her way, is it not? Mother Nature puts us to the test. Though her rewards are always true. It’s the epitome of love. The lessons she brings through her cooking. Her kitchen is a classroom. And within this realm of creativity, she re-cooks her own love story. . .
. . .the ART and TASTE of LOVE!